One could say that the F112 is a typical HRT car, as it was not ready in time for the three winter test sessions that the teams usually do together. Because the FIA changed the regulations, requiring all tested cars to have passed all 18 crash tests, the team was unable to test the F112 due to failing a single test. When the car finally got fixed and passed the tests, there was only time left for 2 filming days, each with a maximum of 200km. At least that is 400km more testing than the F110 and F111 had before arriving at the first GP. The F112 has been designed and developed at the technical office located in Munich, Germany. It is still powered by the Cosworth engine, coupled to a Williams gearbox. As such there is a big piece of the car unchanged, but aerodynamically, the team had to make sure it fitted new, changed regulations. Unsurprisingly, due to the team's limited budget, the car is a simple and clean design, including a front and rear wing extremely similar to the versions run on the HRT F111. The nose is of course different and includes a bulge ahead of a front bulkhead, in order to both meet the height regulations as well as try to get as much air as possible under the nose and under the car towards the diffuser. The car also features rather pronounced safety bulges left and right of the driver's helmet, which, while safe, could certainly induce higher drag compared to the lower versions top teams are using for several years. More at the rear, the exhausts are located on top of the sidepod and rather far away from the car's centreline. The bulge at the rear end of the sidepods is rather pronounced as well, but this could be very well due to the Cosworth engine being wider or requiring a bigger airbox. And again, just like its predecessors, it quickly showed that the HRT was not up to par to any other F1 car. 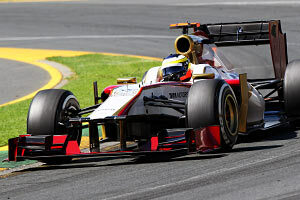 In fact, at the first GP of 2012, held at Melbourne, Australia, both cars failed to qualify within the 107% rule by more than a second and were hence not allowed to race. As of the second race however, both drivers managed to qualify their cars at each event, albeit without ever getting close to a points finish. Towards the end of the year, the car also began to show more reliability issues as the team was rumoured to be using worn parts due to a lack of money. HRT ended 2012 as 12th and last in the constructors' championship and subsequently folded. Front Suspension: Carbon Fibre Double wishbone with pushrod operating torsion springs and anti roll-bar via rocker. Rear Suspension: Carbon Fibre Double wishbone with pullrod operating torsion springs and anti roll-bar via rocker. Wheel: Carbon Fibre with integrated electronics and instrumentation.